With classes starting again soon, I decided to tell you all what I found most necessary to bring with me to every class. I will also be including a little portion for those Graphic Design majors out there, just like me! 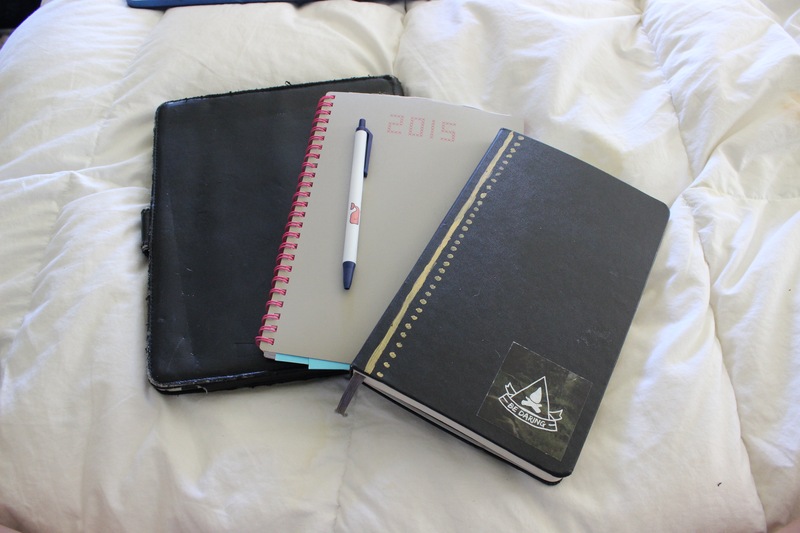 I cannot live without my planner, it is how I get by every day without over-stressing. Basically a place to write down anything that comes to mind, so you can write it down before you loose the best idea you’ve ever had. I usually go to the library between classes or the cafe, so I like to be able to get my work down throughout the day, so it doesn’t build up. Also, especially for those people who take notes on their laptops (I use OneNote from Microsoft). This one is obvious! You’re most likely always going to want your phone on you. Hate to be running to class and your computer is dead and can’t take notes or your waiting for an important phone call and your phone dies… basically, just don’t be stuck without your chargers because your not guaranteed someone will have one that works for your device! Don’t want to end up in class with a notebook and no pen. I also carry around a mechanical pencil for sketching purposes. Most people will think that you don’t need it for class, but you don’t know how many times I was on my way to class and some event was happening where I could get free food or free stuff (emphasize on the word free) they usually need to scan your ID in order to get that free stuff. They will always come in handy. Whether you are listening to music or taking a phone call, it will always come in handy. And if someone around you needs a pair and you don’t, you can make a new friend! Always take a granola bar or something with you when you leave in the morning. Next thing you know it’ll be 2 o’clock and you have 2 more classes, your stomach is growling and you have to go spend your last five dollars on a gross muffin from the dining hall, just to stay on good terms with you class mates due to your stomach being too loud. For my Graphic Design People, I usually carry around a box of a few essentials I always find myself needing, these essentials include; a box cutter, my x-acto blade, a mechanical pencil, eraser, a sharpie, scissors, and a micron pen. Depending on what project I am working on, I will carry other things with me for when I am class and at the studio. I hope this helps you with your preparation for heading back to school!